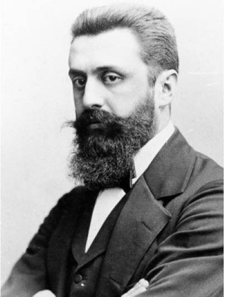 Theodor Herzl was the founder and president of the Zionist Organization, the modern political movement to establish an independent Jewish state. 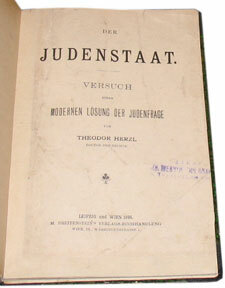 A successful Viennese journalist and playwright, Herzl published his Zionist manifesto The Jewish State (“Der Judenstaat”) in 1896. The following year, he convened the first Zionist Congress with the aim of taking practical steps to establish the Jewish state. Herzl led the Zionist Organization for seven years until his death in 1904 at age 44. Herzl is the only individual mentioned by name in Israel’s Declaration of Independence, which refers to him as the “author of the vision of the Jewish state” (הוגה חזון המדינה היהודית). Herzl’s efforts on behalf of Jewish restoration in Palestine were many and varied. In addition to the annual Zionist Congresses, he conducted a broad diplomatic effort that involved him in negotiations with the leadership of Britain, Germany, Russia and the Ottoman Emprire over the issuing of a formal charter for a Jewish government in Palestine. He established hundreds of chapters of the Zionist Organization throughout Europe and in America, a Jewish national bank and the Zionist newspaper Die Welt. Herzl’s campaigns paid off in pledges of support from British candidates running for office already during his lifetime. During World War I, a decade after Herzl’s death, his former legal counsel in Britain, David Lloyd George, became Prime Minister and adopted a policy of establishing a Jewish national home in territories liberated from Turkey by British forces. This alliance between Britain and the Zionist Organization brought hundreds of thousands of Jews to Palestine and led to the establishment of Israel as an independent Jewish state in 1948, a mere 52 years after the publication of Herzl’s book The Jewish State. Today, Herzl is remembered principally for his “political Zionism”–a term coined by his principal detractor, Ahad Ha’am, as a term of derision. 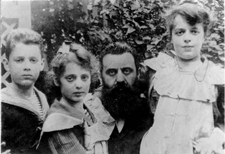 Herzl realized that the rapid rise of anti-Semitism in France, Germany, Austria and Russia was leading to a catastrophic persecution of the Jews, and saving Jewish lives was a principal motive behind his efforts to establish a territory under Jewish legal and military control that could serve as a place of refuge. In Herzl’s writings he repeatedly emphasized that the creation of a Jewish homeland was merely the external change that he wished to attain. 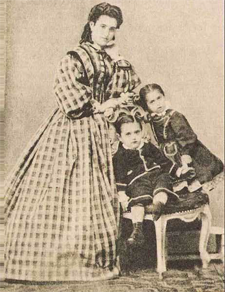 The true aim was the establishment of a firm Jewish consciousness, a unique Jewish “character” and perspective on things that the Jews would contribute to the world, and by means of which they would again be able to play a special role among the nations.